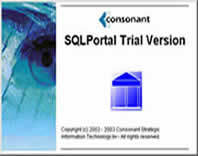 SQLPortal Professional is a reporting tool that allows you to incorporate all relevant information from Microsoft Access, Microsoft SQL Server or Oracle databases into your Microsoft Word document. The product is well suited for Business Intelligence, Data Mining and Word Processing. The program has a short learning curve. No programming skills are required. 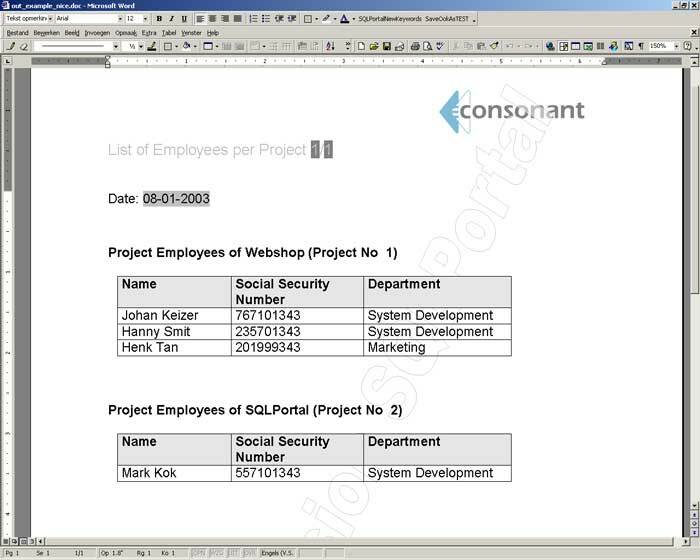 With SQLPortal Professional users can create their own letters, contracts, reports and mailings containing data from the database. 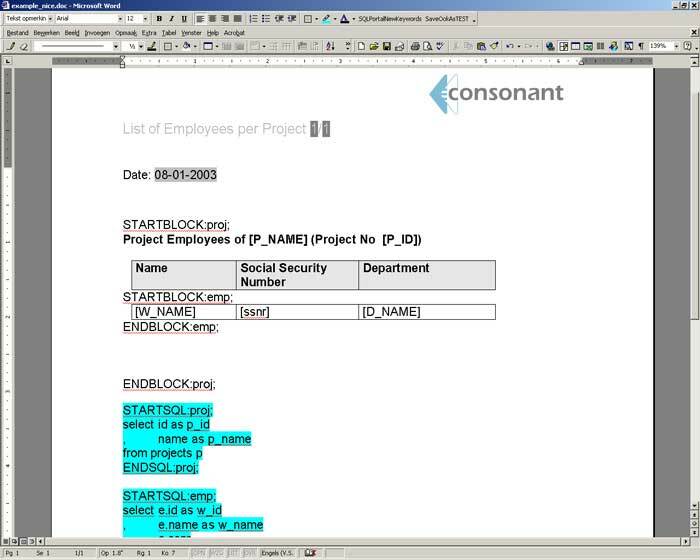 All they have to do is to add database fields and database queries to their Word document. ICT Departments can use the tool to effortlessly satisfy company? reporting needs in a cost effective way. Parameters can be directly specified on the command line. The use of parameter file is not required anymore; The Multimedia Tutorial can be downloaded separately as needed; Help embedded within the application. Keyboard shortcuts; Multimedia Tutorial available to aid rapid learning of the program's basic function; Tips on startup; Keyword generator; Enhanced uninstall mechanism; Fully integrated with Microsoft Word. The lay-out of the document is entirely carried out in Microsoft Word; Very user friendly; Short learning curve; Programming knowledge is not required! 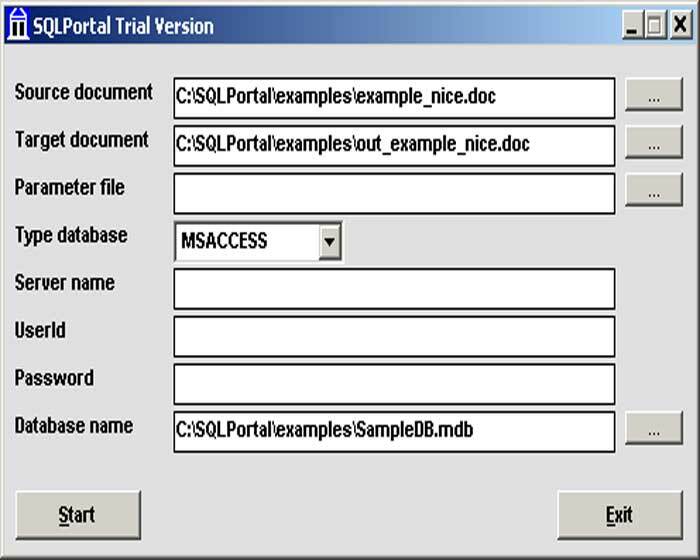 SQLPortal Professional supports any Oracle database starting at version 7.x / Microsoft SQL Server starting at version 6.5/ Microsoft Access database starting at version 97. Any data within a database can be accessed; Preserves completely the integrity of the data in the database; Support of infinite master-detail information by the use of nested structures; The lay-out of the document and the database queries are defined fully in one Word document. Source document can be in any format that your version of Microsoft Word supports; The output document is in Microsoft Word native format (.doc); Command line parameter passing for automated tasks ; Graphical User Interface (GUI) available .